It has been one quick passing summer and the truth is I haven't had much time to get out and smell the flowers. I am not complaining, I have been working really hard, and we all have to put our time in. But my really incredible and inspiring friend Amy Beth, of ABCD Design has been filling my feed with her beautiful work, and I am grateful for the updates and all the pretty pictures that brighten my day. Amy Beth and I met on twitter a while back. I think 2009 when I first started blogging and using social media. I even won a little apron giveaway on her blog, which I still use. We have a lot in common, strong family & friendship values, bringing people together, good quality design, balancing modern and antique, cooking..and eating :) You can imagine my excitement when she needed a fireplace screen for her home and I could be a part of her world. 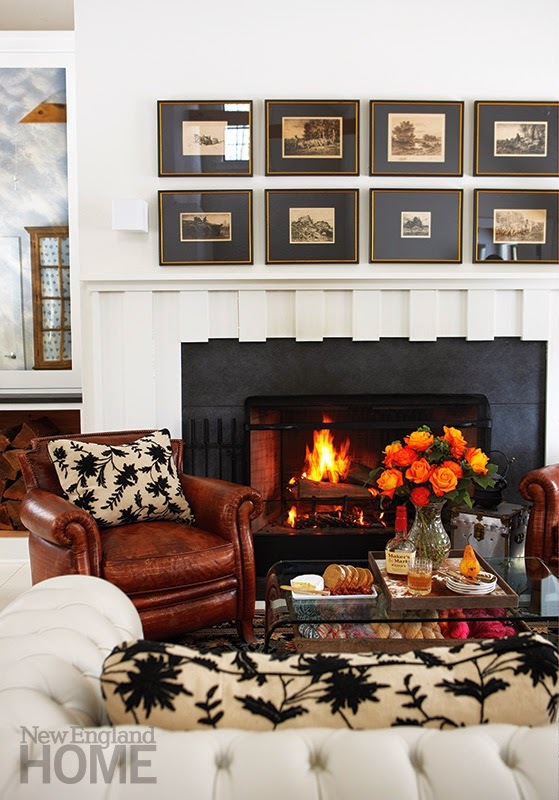 Her home was photographed for New England Magazine, and there is our Boston Screen right there in front of the fire. Her entire Connecticut home is lovely. You can grab a full tour of her place here at NEHome. I adore her collections of tea cups and pots, dishes and canisters, artwork and figurines. Everything is a treasure and and has a story behind it. But lately, I have been obsessed with her colourful floral arrangements. Every one is breathtaking, and they look so effortlessly gathered. The colours so lively and energizing. Purples and reds, orange and yellows so boldly complimenting her home and style. So here is my official THANK YOU Amy Beth, I can't wait to see what the fall brings!